He'd even settle for a Lionwhyte DLC pack. 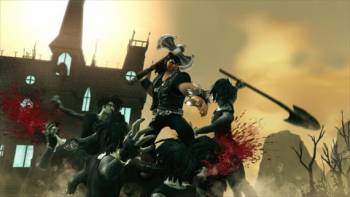 Depending on who you talk to, Brutal Legend may not have been Double Fine's best game. To some, it was an underrated gem. To others, it was a mess of genres. In an interview with GameSpot, Double Fine's Tim Schafer said that he'd love to revisit the game sometime, even if only via a DLC pack. "I love that world and I would love to go back there, Schafer said. "And I think [actor Jack Black] might be up for it, too." While self-funding games via Kickstarter might be great for smaller-scale projects like Broken Age, keep in mind that it won't come close to covering the $25 million spent developing Brutal Legend. "I would love to go back to that world or even just do a DLC pack...we're always trying to get Lionwhyte in there; a playable Lionwhyte army," Schafer added. "Maybe that would happen someday. I would definitely love to do that." It's been five years since Brutal Legend released on the Xbox 360 and Playstation 3, but a port hit PCs last year. According to Schafer, it was Double Fine's best selling game, even topping the sleeper hit Psychonauts. There's a lot of potential waiting to be tapped in the Brutal Legend universe, even if releasing a DLC pack for a five-year-old game seems odd.